New York, NY — The second annual Go Africa Harlem Street Festival will be held ‪Saturday, July 16 from 10 a.m. to 7 p.m. on 116th Street within the boundaries of Adam Clayton Powell and Frederick Douglass boulevards in Harlem. Manhattan Borough President Brewer’s Immigrant Task Force is a proud support of the event. Shaun King, senior justice writer for the New York Daily News and a prominent civil rights activist known for his use of social media to shed light on social causes, will serve as master of ceremonies. Manhattan Borough President Brewer’s Immigrant Task Force; and Halstead Property. HONG KONG — The International Monetary Fund on Monday approved the Chinese renminbi as one of the world’s main central bank reserve currencies, a major acknowledgement of the country’s rising financial and economic heft. In honor of Global Entrepreneurship Week 2015, IdEA is hosting an online resource training to share with entrepreneurs the rich resources that are available to them. Join us on Friday, November 20 at 1pm EST to learn more! Martin Ezemma and Jean-Robert Baguidy will join us from the Minority Business Development Agency to share what resources they offer entrepreneurs, and in particular their African Diaspora and Minority Business Enterprise Engagement activities. You will also hear from IdEA about our online mentoring group, and about other resources IdEA members have shared for entrepreneurs. Register for this FREE Webinar here. National Small Business Week has been recognizing the special impact made by outstanding entrepreneurs and small business owners since 1963. During this week, the U.S. Small Business Administration honors small business owners and entrepreneurs for their outstanding achievements through various awards. To use the Small Business Week Nomination Portal, you will need to register for an account. Registration is required to protect your information from unauthorized access. This site complies with the Federal Information Security Management Act. For more information, visit http://www.sba.gov/about-sba-info/privacy-policy. Want to get your Brunch On? Try a Go Africa® Mimosa or Ginjan® Mimosa! Fill champagne flute with 2 ounces of Ginjan® Premium brand organic ginger juice and top up with brut champagne. For a true, old-school Buck’s Fizz, add 1/2 teaspoon grenadine; for a true Mimosa, it’s a teaspoon or so of Grand Marnier (not enough, we’re afraid, to compensate for the champagne deficit). /wp-content/uploads/2015/07/logo-go-africa-news-294x300.png 0 0 Dr. Dennie Beach /wp-content/uploads/2015/07/logo-go-africa-news-294x300.png Dr. Dennie Beach2015-10-25 15:59:542015-10-25 15:59:54Want to get your Brunch On? 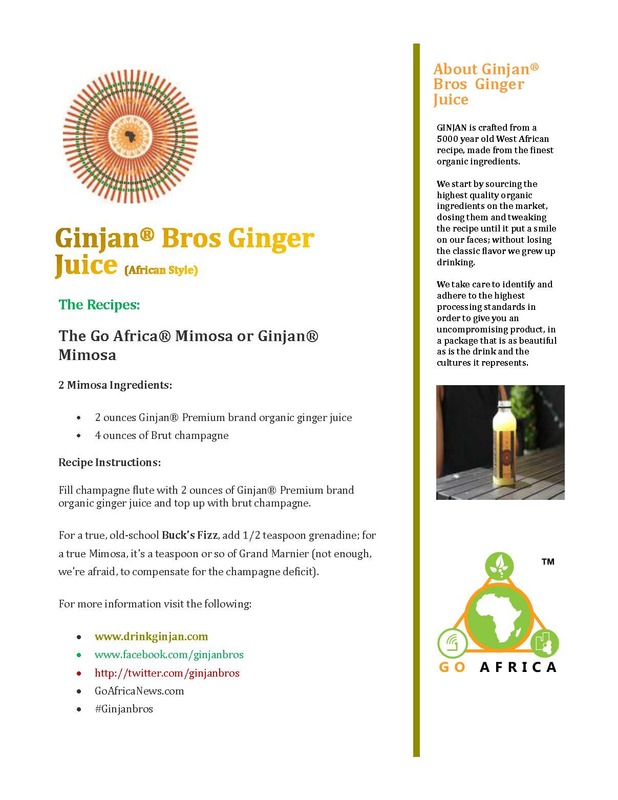 Try a Go Africa® Mimosa or Ginjan® Mimosa!